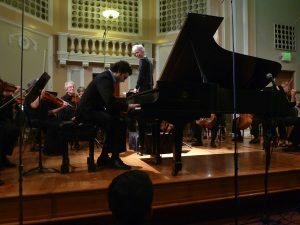 Peninsula Reviews: "a first-class performance"
Guest artist/pianist Soheil Nasseri drew on his considerable technical and artistic prowess to render a first class performance of Schumann’s well-known and always enjoyable piano concerto. The third movement, designated Allegro vivace, was performed with impressive interaction between the keen eye and ear of Maestra Ray and soloist Nasseri. The dynamic balance throughout the challenging syncopated moments was noteworthy. Nasseri’s voicing was enhanced by admirable subtleties of shading and dynamics, especially in the cadenza. A significant crowd turned out for this concert, including several prominent guests. The concert was apparently made possible in large part by a grant from Dagmar Kantorova, recent winner of the Nobel Prize for Peace through Music. Ms. Kantorova had traveled from Salt Lake City to be here tonight.